Hello, my name is Stu. I've been practicing for up to two hours a day for a little over six years and I still can't play a complete song. My wife says it’s because I'm in my seventies. I disagree. 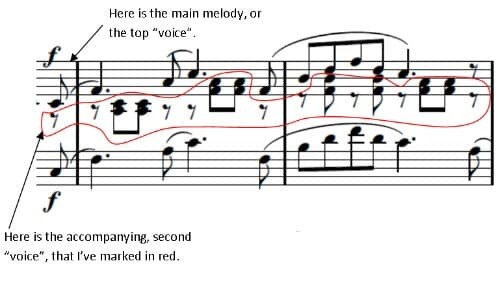 I've run into a little question about the way some the notes are written on a lot of the sheet music I have been using. I have notes that are clearly written as a half note or a quarter note, and a there's a quarter or an eighth rest over or under it. It doesn't make sense to me. How do I play it? Wow, that is some dedicated time you’ve spent practicing indeed! With such passion and discipline you should see some results of course. As for why, I agree that age has nothing to do with it. Instead, I’m guessing from your question about the note values (which I’ll answer below), that perhaps you are approaching repertoire that is too hard too soon? To be able to see results sooner, and to enjoy the feeling of accomplishment after learning a complete piece, everybody needs to play easier pieces than what one may think. Sure, it can be frustrating if you are longing to play for example Beethoven’s «Appassionata» sonata, to play a much, much simpler piece, but the best way to master any instrument is by gradually playing harder and harder repertoire. You need to both have patience, and a certain amount of stubbornness, to gradually increase challenges. Make sure to start with a level where you easily can learn the whole piece, and then pick a slightly more difficult piece and so on. In this example; «The Happy Farmer» by R. Schumann, you can see the top melody, and an accompanying part (marked with red) on the same staff. So, the rests you see are for this "second" part, or voice. How to play it? It is a good idea to practice each part separately first, to play it correctly and to get a feel for each separate part. Then combine the parts, keeping as much as possible of the sound of each part, with rests, dynamics, articulation and all.